It’s probably fair to say that the Hubble Space Telescope, which recently celebrated its 25th birthday, has become the world’s most famous telescope in large part due to the breathtaking astronomical images it has captured. Hubble’s images reveal the complex, three-dimensional structure of galaxies, nebulae and star-forming regions with incredible acuity, chiefly because the telescope is in space. For ground-based telescopes, the Earth’s atmosphere has a blurring effect, limiting the sharpness of the images they produce. Hubble’s images are limited only by the telescope’s engineering and the properties of light itself. In 1990 I was privileged to be present at the space shuttle launch which carried Hubble into orbit. The combination of the launch’s powerful demonstration of the defiance of gravity, coupled with the promise of what Hubble would do for astronomy was overwhelming. Curmudgeonly male scientists wept. Perhaps the affection directed towards Hubble is also partly due to the telescope’s troubled start: the primary mirror was very precisely manufactured, but to the wrong shape. For the first three years of operation, Hubble’s ability to produce sharp images was compromised, to the point that “Hubble Telescope” was a joke appearing in cartoons and punch-lines. 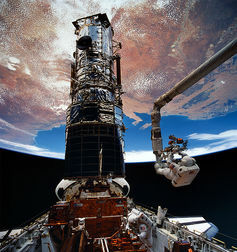 Astronauts Hoffman and Musgrave working on the Hubble Space Telescope in 1993. So engineers produced COSTAR, a component that would correct the optical problems with the primary mirror. Installed during the first space shuttle visit to Hubble, it worked a treat. Like a flawed hero or a prodigal child, Hubble’s triumph over adversity has universal appeal – the best stories, like the best images, have contrasts between darkness and light. Fortunately, not all of Hubble’s science had to wait three years for the first servicing mission. Scientific astronomy is carried out in other regions of the electromagnetic spectrum than just visible light, for example ultraviolet (UV) light. UV is invisible to our eyes, but forms the continuation of the visible spectrum beyond the violet. 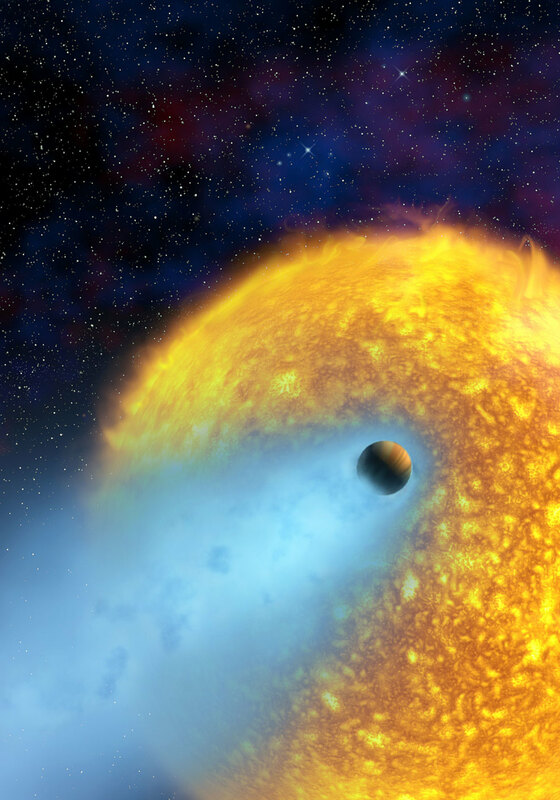 A ‘hot Jupiter’ exoplanet’s atmosphere is stripped away by the heat of its star. Hubble had always been intended to serve as an ultraviolet telescope – from space, UV light that would otherwise be absorbed by Earth’s atmosphere can be collected. Light in this part of the spectrum is more energetic than visible light and is emitted by most stars, including our own, and many other astrophysical objects. Studies in ultraviolet radiation reveal things that can’t be learnt from telescopes on the ground. Hubble has produced many, many UV science results. My favourite is the spectacular discovery in 2003 that the exoplanet HD209458b is surrounded by a huge cloud of hydrogen gas. This type of exoplanet, known as a “hot Jupiter”, orbits its star so closely – only a 20th of the Earth’s distance from the sun – that the star’s heat boils off the planet’s atmosphere. This sort of discovery offers a great opportunity to learn what exoplanets are made of. Spectroscopy is the key: each chemical substance has its own spectroscopic fingerprint that allows astronomers to measure chemical compositions – and the UV region of the spectrum is particularly sensitive and useful for this purpose. Hubble has used these strong UV features to reveal the presence of hydrogen, magnesium, iron, silicon and other chemicals in the atmospheres of several hot Jupiter-style exoplanets. Our ultimate fate: a white dwarf star collapsed from a giant red, surrounded by remnants of its inner planets. The loss of the atmosphere of these exoplanets is a preview of the ultimate fate of the Earth, when the sun becomes a red giant star in about four billion years time. As the sun begins to exhaust hydrogen at its core and begins to burn helium, it will swell and become hotter and brighter, engulfing Earth and the inner planets. Once it has exhausted its nuclear fuel, it will collapse into a white dwarf star – about the size of the Earth, and surrounded by the remnants of our solar system. 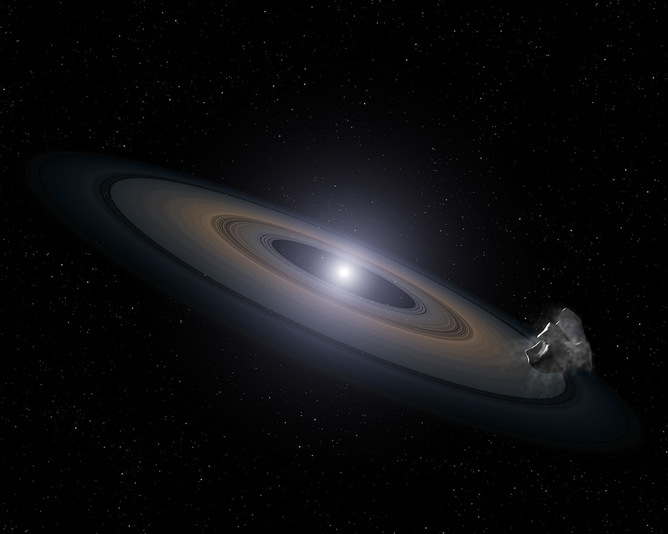 Hubble UV spectroscopy of white dwarf stars has revealed that many of them are being continually bombarded by asteroids feeding the stars with rocky material. These observations allow us to learn the types of rocks present in extinct planetary systems which were perhaps once very similar to our own solar system. Appearance in UV of aurorae on Ganymede. 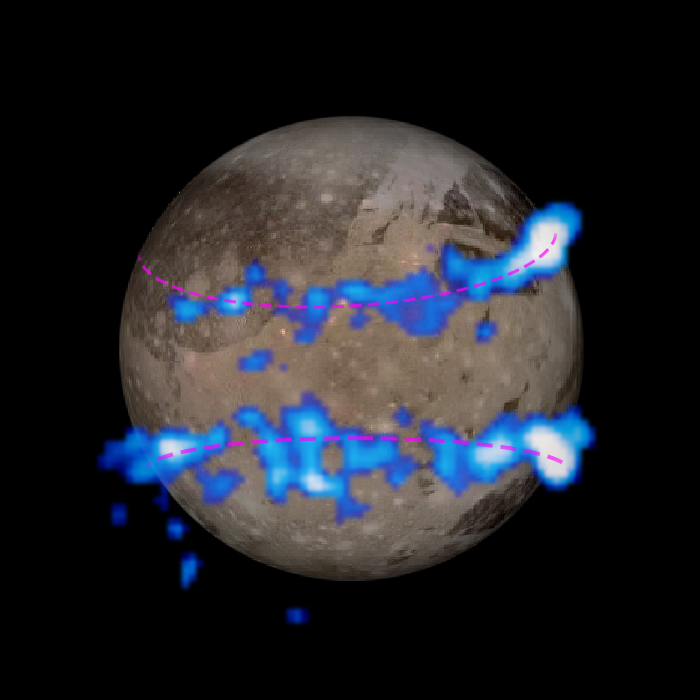 Most recently and closer to home, UV images reveal the aurorae around Ganymede, Jupiter’s largest moon. Just as with Earth’s aurora borealis and australis (northern and southern lights), Ganymede’s aurorae change continuously with the influence of Jupiter’s magnetic field. Hubble captured changes in the aurorae caused by the presence of an underground salt-water ocean on Ganymede – an ocean that probably has more water than all of Earth’s oceans combined and may provide a habitat for life. Hubble has continued its mission well beyond its original planned lifetime. It has made over a million observations and generates about ten terabytes of new data each year. The current plan is for it to operate beyond 2020, to allow some overlap with its replacement, the NASA/ESA/Canadian Space Agency joint project, the James Webb Space Telescope (JWST). Sadly for UV astronomy, the JWST will work predominantly in infrared and has no UV instruments. This leaves many astronomers keen to see a successor to Hubble that will continue it’s unique work in UV, which has added so much to human understanding by working beyond what we can see.